It was last week when my dear friend and former classmate in UP Diliman, Architect Aimee Maceda Aquino, invited me to travel to Thailand with her. I’ve been promising to go on a trip with her and our other friends for years but somehow, I just couldn’t get the right timing. This time, I felt I had an obligation to do so as my retired architect friend needed the time to relax as she takes care of her ailing 90-plus-old father. Planning a trip with my OC friend assures you of a relaxing one that you just have to ride on. Aimee is so organized, just like her beloved first cousin Consul Baby Maceda-Montemayor, as an experienced traveler that she does everything from A-Z. All you have to do is to approve her plans (you dare not contradict her choices) and pay. So it was on a Sunday last February 10, 2019, when we arrived at Bangkok’s International Airport named Suvarnabhumi Airport. Suvarnabhumi was the name chosen by the late King Bhumibol Adulyadej and refers to the ancient golden kingdom of Thailand said to have been located somewhere in Southeast Asia. Upon setting foot at the immigration section, I always feel overwhelmed (this was my third visit to Bangkok) with the number of tourists visiting Amazing Thailand. You always get to ask yourself why we could not get these number of tourists to visit Wow Philippines. Despite the news on Bangkok’s PM2.5 haze attack, extreme heat, fast appreciation of the baht, plus of course, Thai protests and coups causing political instability, Thailand’s Tourism remains the Kingdom’s source of income accounting for a fifth of the economy. And Chinese tourists are integral in realizing Thailand’s projected 41 million visitors this year. Thailand is one of the top five global destinations for travelers from mainland China. The Chinese travel market is embracing a golden age of consumption upgrading the rise of the experience economy such that Thailand becomes one of the top destinations for Chinese travelers all year round and especially during peak festive seasons. Remember as well that after the military coup in 2014, the wise Thai generals turned to Beijing to realize their dream of transforming Thailand into an innovative, developed country with China-backed infrastructure. Those manning the queues at the Immigration will direct you to line up depending on one’s passport: Foreign Passport, Southeast Asian Passport, or Chinese Passport. The Thai Immigration is well organized and efficient in doing its job that it was a breeze for Aimee and me to have our passports stamped and headed straight for a taxi ride to get to our Holiday Inn Hotel located along Rama I Road Wang Mai, Bangkok. 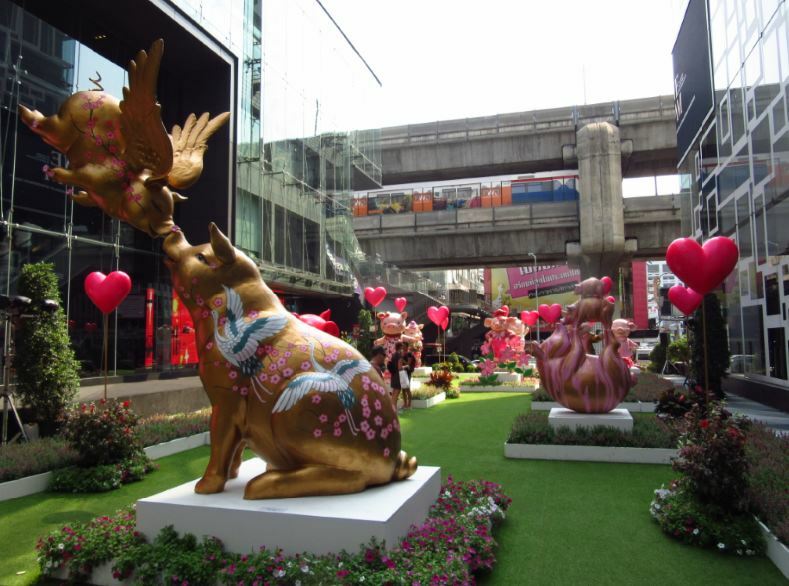 Just as I thought, smart Aimee had chosen a hotel that is at the center of Bangkok’s famous Siam shopping district. My room at the 10th floor had a good view of the National Stadium and Bangkok Cityscape. Holiday Inn is also a few minutes walking distance from shopping malls like MBK (imagine Aldevinco all of six stories with stalls selling all kinds of goods you can imagine), my fave Tokyu, and the more expensive malls like Siam Paragon, Platinum, Siam Discovery, Central World, Isetann, to mention some. 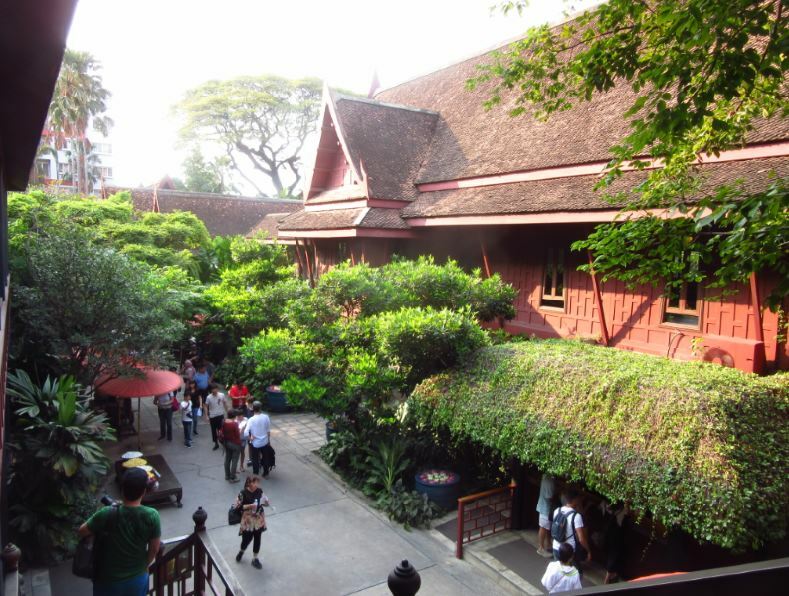 After checking in at Holiday Inn, we went straight for late lunch at the famed The Jim Thompson House. The two-decades-old Jim Thompson Restaurant is truly a culinary experience where traditional Thai cuisine and friendly service create the ultimate in Thai dining. We had our fill of the famous Phad Thai (Thai style pancit); Tom Yum Goong (spicy shrimp soup); Som Tum (papaya salad); Padkrapw Moo Sap (fried pork with basil); and Kai Muk Ma Muay (chicken with cashew nuts). It was truly delicious. Honestly, even in the not so well-known Thai restos that we went to, the food was surprisingly good. 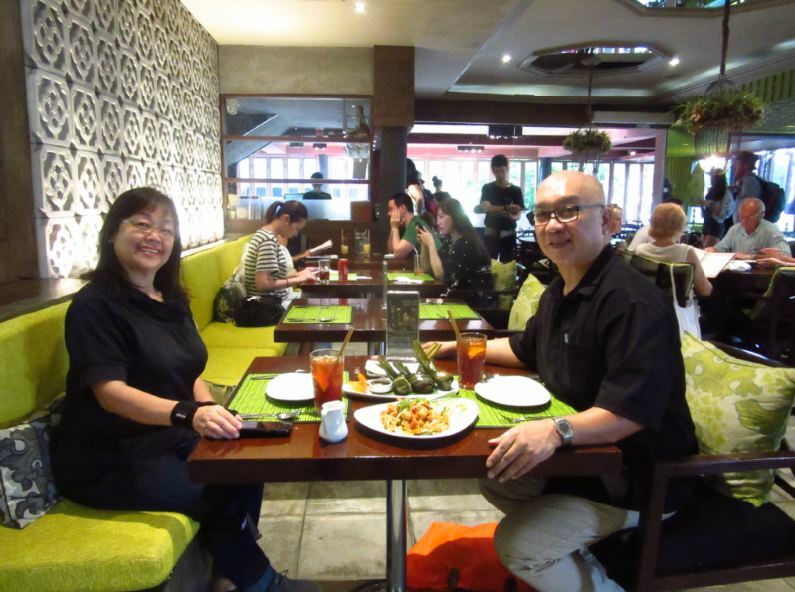 In the days to come, Aimee and I also had our fill of Japanese cuisine which is also very popular with the Thai people. The following days had us visiting landmarks of Thailand. First stop was at the Suan Pakkad Palace Museum which was built on a former Chinese cabbage garden. 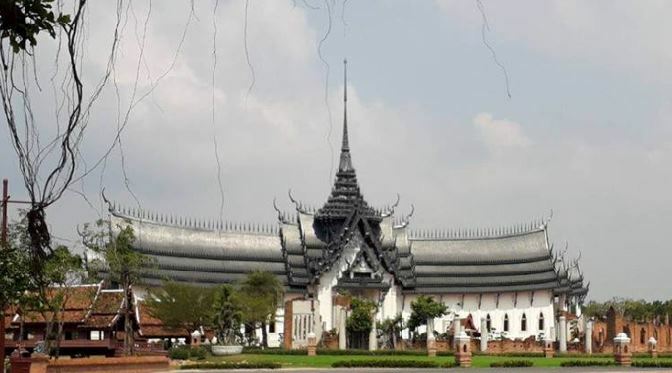 It became the residence of Prince Chumbhot Paribatra of Nagor Svarga, a grandson of King Chulalong Korn (Rama V) and his wife, Princess Chumbhot Paribatra. 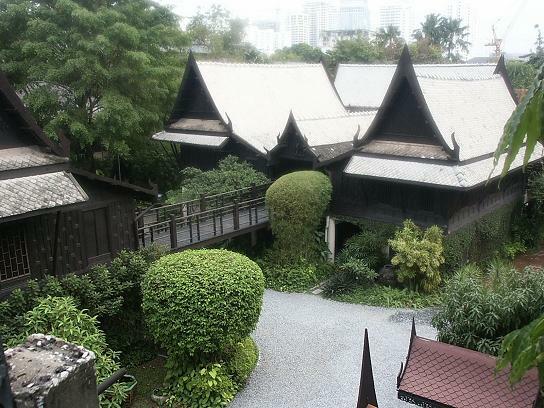 The palace museum showcases a group traditional Thai houses of wood dating from the 19th century. These traditional houses were transported from their former location and reconstructed on the Palace grounds in 1952; and used as both a reception hall and a place to display the royal families’ extensive and priceless collection of artifacts that were inherited from the father, Prince Paribatra Sukhumbhand of Nagor Svarga. This was the first royal Thai family’s home which was opened to the public. Amazing!